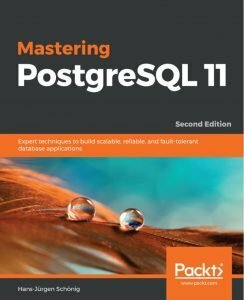 This second edition of Mastering PostgreSQL 11 helps you build dynamic database solutions for enterprise applications using the latest release of PostgreSQL, which enables database analysts to design both the physical and technical aspects of the system architecture with ease. This book begins with an introduction to the newly released features in PostgreSQL 11 to help you build efficient and fault-tolerant PostgreSQL applications. You’ll examine all of the advanced aspects of PostgreSQL in detail, including logical replication, database clusters, performance tuning, monitoring, and user management. You will also work with the PostgreSQL optimizer, configuring PostgreSQL for high speed, and see how to move from Oracle to PostgreSQL. As you progress through the chapters, you will cover transactions, locking, indexes, and optimizing queries to improve performance. Additionally, you’ll learn to manage network security and explore backups and replications, while understanding the useful extensions of PostgreSQL so that you can optimize the speed and performance of large databases. By the end of this book, you will be able to use your database to its utmost capacity by implementing advanced administrative tasks with ease. PostgreSQL is an open source database used for handling large datasets (big data) and as a JSON document database. 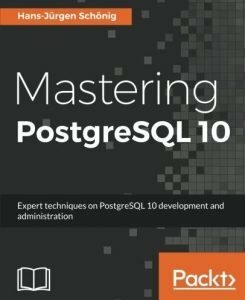 This book highlights the newly introduced features in PostgreSQL 10, and shows you how you can build better PostgreSQL applications, and administer your PostgreSQL database more efficiently. We begin by explaining advanced database design concepts in PostgreSQL 10, along with indexing and query optimization. You will also see how to work with event triggers and perform concurrent transactions and table partitioning, along with exploring SQL and server tuning. We will walk you through implementing advanced administrative tasks such as server maintenance and monitoring, replication, recovery, high availability, and much more. You will understand common and not-so-common troubleshooting problems and how you can overcome them. By the end of this book, you will have an expert-level command of advanced database functionalities and will be able to implement advanced administrative tasks with PostgreSQL 10. We begin by explaining the advanced database design concepts in PostgreSQL 9.6, along with indexing and query optimization. You will also see how to work with event triggers and perform concurrent transactions and table partitioning, along with exploring SQL and server tuning. We will walk you through implementing advanced administrative tasks such as server maintenance and monitoring, replication, recovery and high availability, and much more. You will understand the common and not-so-common troubleshooting problems and how you can overcome them. By the end of this book, you will have an expert-level command of the advanced database functionalities and will be able to implement advanced administrative tasks with PostgreSQL. With more than a quarter of a century of development and innovation, PostgreSQL has gained a reputation for stability, robustness, and ease of use. The variety of features available within PostgreSQL makes it a powerful tool for your professional relational database infrastructure. 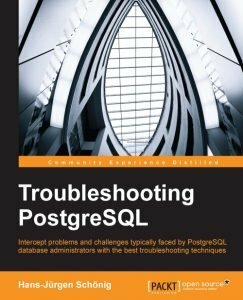 With the database administrator in mind, this compact, easy-to-read, and practically-oriented book will make your daily handling of PostgreSQL more efficient and rewarding. You will learn about optimization, bottleneck detection, backup and recovery, replication, logfile management, indexing, and much more in a systematic and carefully structured manner. 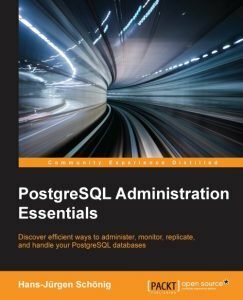 This invaluable guide will enable you to develop the fundamental skills required to deploy PostgreSQL in order to efficiently manage your databases. Discover efficient ways to administer, monitor, replicate, and handle your PostgreSQL databases. 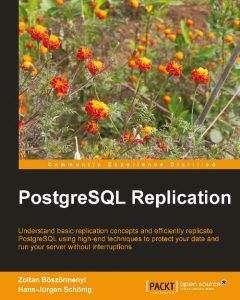 We are proud to announce our latest book called “PostgreSQL Replication”. synchronous replication, as well as with a variety of other topics. We hope that our work is beneficial to many people using PostgreSQL out there. PostgreSQL is an object-relational database server that is widely considered to be the world’s most advanced open-source database system. It is ANSI SQL-compatible, and it offers powerful features to enable more complex software design than would be possible with relational databases that are not object-oriented. PostgreSQL is extremely modular, it supports a large number of datatypes, and programming interfaces for PostgreSQL are available for all important programming languages, including C, Perl, Python, Tcl, Java, and PHP. 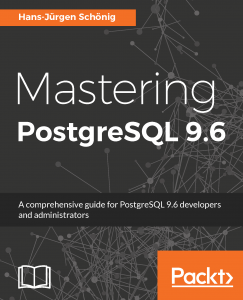 PostgreSQL Developer’s Handbook provides a complete overview of the PostgreSQL database server and extensive coverage of its core features, including object orientation, PL/pgSQL, and the most important programming interfaces. 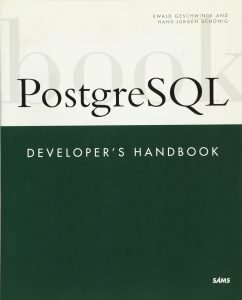 The book introduces the reader to the language and syntax of PostgreSQL and then moves quickly into advanced programming topics. There is a strong demand for books that describe how to use PHP together with a specific open-source database to develop Web applications. While MySQL is very popular, PostgreSQL is widely considered to be the more powerful of the two open-source databases. And PostgreSQL is rapidly gaining market share-large organizations are beginning to use PostgreSQL instead of Oracle; the demand for PostgreSQL training and support has increased by some accounts 50% in the last six months; and Web hosting services increasingly offer PostgreSQL along with MySQL. PHP & PostgreSQL Advanced Web Programming focuses on the specific needs of a PostgreSQL developer and will detail how to make use of PostgreSQL’s unique, advanced features to develop high-availability, fail-safe Web applications with PHP and PostgreSQL. 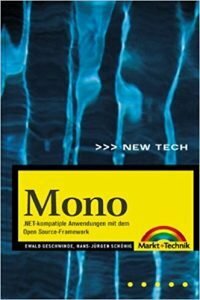 Mono ist das Open Source-Framework für Programmierung und Einsatz .NET-kompatibler Anwendungen unter Unix, Linux und Windows. Mono vereint die Vorteile der großen Frameworks .NET und J2EE – Sprach- und Plattformunabhängigkeit – mit den Vorzügen freier Software. Dieses Buch bietet Ihnen als Profi-Programmiererin oder -Programmierer eine praxisorientierte und uebersichtliche Einführung in Mono und die NET-Kernsprache C#. Es beschreibt umfassend und übersichtlich alle relevanten Aspekte der Anwendungsentwicklung – von Datentypen und Klassen bis hin zu Thread-, Netzwerk- und GUI-Programmierung (mit gtk# und Qt#). Das Vorwort schrieb Mono-Gründer Miguel de Icaza. Datenbank-Anwendungen mit PostgreSQL. Einführung in die Programmierung mit SQL, Java, C/C++, Perl, PHP u.a. 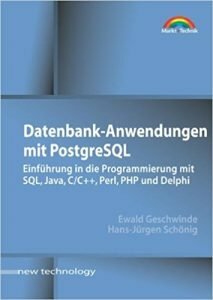 Dies ist ein Buch für Datenbankprofis, die nach PostgreSQL migrieren und einen Einstieg in Administration und Programmierung der Open Source-Datenbank auf hohem Niveau suchen. Aufbauend auf einer Einführung in PostgreSQL, seine Installation, Administration, Optimierung und einem Tutorial zur Arbeit mit SQL, führen die Autoren praxis- und lösungsorientiert in die Arbeit mit den wichtigsten Programmierschnittstellen von PostgreSQL ein: Java, C/C++, Perl, PHP, Tcl, PL/pgSQL, ECPG, EFEU und Delphi. Jede von ihnen wird ausführlich vorgestellt und ihr Einsatz an einem praxisnahen Beispiel gezeigt. 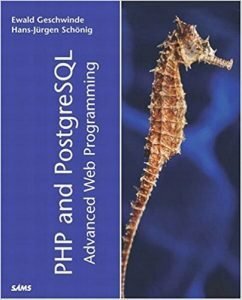 Das Buch schließt mit einer Übersicht über PostgreSQL-Interna. Die beiliegende CD enthält einen Teilabzug von ftp.postgresql.org mit PostgreSQL und Tools für alle großen Plattformen sowie alle Beispiele aus dem Buch. Mono is an open-source implementation of the infrastructure upon which Microsoft’s .NET Framework is built. Providing a compatible option with all of the technical features of .NET without the restrictive licensing and prohibitive costs that Microsoft imposes, the Mono project was initiated and co-financed by Ximian Corporation for the development of an open source version of .NET Framework for Linux/Unix and Windows platforms (Mac OS X support will be added).. Mono will allow cross-platform programming and operating of .NET compatible applications. Experts see the presence of a Unix-compatible version as decisive for the success of .NET. 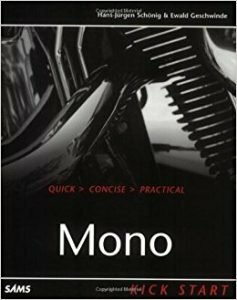 Mono Kick Start is a practical introduction to Mono and .NET compatible application programming with Mono. After a classically structured crash-course on the C# language and Mono’s own compiler, the authors reach down deeper to subjects like threads, network programming, security, database interaction, XML, and more. A comprehensive practical section shows you how to set up Web applications with Mono, how GUIs can be programmed using GTK, and how applications written with .NET can be operated in the Mono framework.